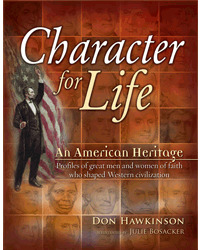 Character for Lifeis bibically sound, historically correct and timely..."
When America was very young, the men and women who cut a civilization out of the New World wilderness did so with sweat, blood, and ingenuity. They also used those invisible qualities so necessary for such an undertaking, namely, elements of character the new country desperately needed. How blessed we all are today that this nation received the gift of the Old World’s finest pioneers in the law, politics, and religion. David Brainerd (1718-1747), whose short life produced sweet fruit in missions and inspired such friends as Jonathon Edwards. Sojourner Truth (1797-1883). This remarkable New York woman, a former slave, worked tirelessly for the rights of the oppressed and left a legacy that is still being explored for inspiration. William Penn (1664-1718). The founder of Pennsylvania, Penn used a land grant in the colonies to found a society based on religious truth and piety. Florence Nightingale (1820-1910). This native Italian, raised in England, revolutionized medicine by spearheading hospital reform. Her emphasis on clean working conditions saved many lives. John Marshall (1755-1835). This soldier of the Revolution became one of the country’s leading lights on the Supreme Court, and as Chief Justice, set a standard for generations.